Mrs C was referred to SDS Options by Fife Forum. She went to day care once a week and paid for support to help with her housework. She was diagnosed with mixed aetiology dementia in July last year and has mobility issues. Her daughter wanted to be able to get a more bespoke package of care for her without having to borrow money to pay for this. Our SDS Options Advisor has been working with Mrs C and her daughter since April. Claire has managed to get personal care for her and she now has carer’s coming in 4 times a day and she had a trial of meals on wheels which was successful. However, she hasn’t been able to get an SDS assessment so far so we wanted to look at how she could be in control of the personal care she receives and use the support she pays for in a better way. Mrs C is still able to do a lot of things herself but her memory loss was meaning she couldn’t remember what she could ask her carers to do. I came up with this solution on the left - Prompt Cards. 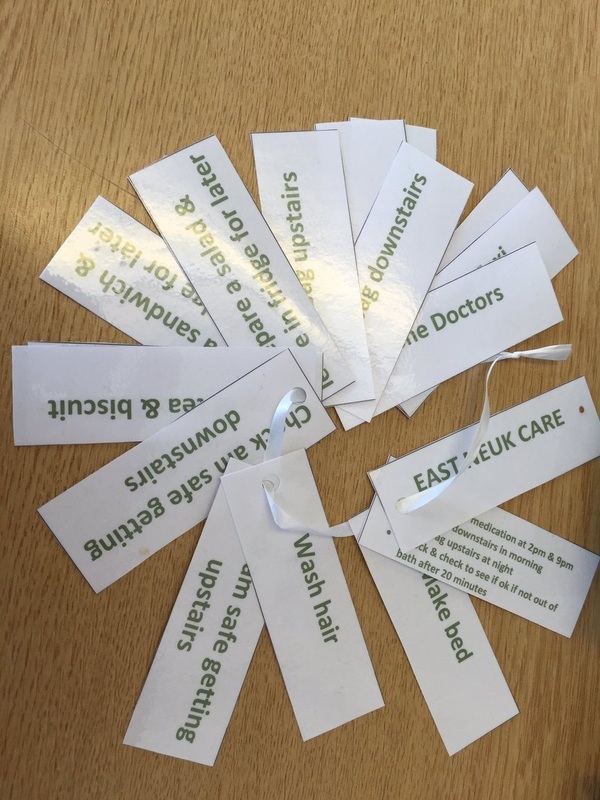 ​Claire made 2 sets of laminated prompt cards – 1 for East Neuk Care who provide her personal care and 1 for the carer she pays for herself. Between looking at her care plan and speaking to her we came up with a list of tasks they could help her with. I typed them up and made them into little cards which I tied together with some string. The purpose of these cards is to help prompt Mrs C when her carers ask her what they can help with. Mrs C can look through the cards to remind herself what they can do as she kept forgetting. Although she can make her own decisions and speak for herself she couldn’t recall what was on her care plan. These cards allow her to be in control of her support and let her make her own decisions about what she wants help with. Claire also helped her look at changing what support she receives from the carer she pays for. The carer was doing shopping on a Monday and housework on a Thursday. What Mrs C really needed though was to get her hair washed and she knew of a local hairdresser that wasn’t too expensive. Due to her dementia she can no longer go places independently and has difficulties walking so needs transport. We made a plan that every 2nd Thursday the carer would take her to the hairdresser so that at least every 2 weeks her hair is washed and she could also go to the bank, post office or quickly go into the supermarket. This allows Mrs C to use her support to do the things she needs and chooses to do rather than sticking to the same thing every week. She also has her prompt cards to use so she can tell her carer what household tasks she wants done. So in this sense she is directing her own support, but she pays for it from her own money. ​As SDS doesn’t seem likely for Mrs C we are looking at what other options there are to get her the care and support she needs to allow her to enjoy social activities to prevent social isolation once her daughter moves to England in October. We are looking into befriending services and also requested a referral to Shared Lives as Mrs C was adamant that she didn’t want to go to day care twice a week but warmed more to the idea of one-to-one support to give her company once a week and the chance to go back to doing the things she used to enjoy e.g. cinema, theatre, clothes shopping. Mrs C is now feeling better about having to get carers in to help her and I could see she was much happier on my last visit. THANK YOU so much for your very thoughtful and kind preparation of laminated memory prompts for my mother…These will make a big difference to the quality of care she receives. It really was a brilliant idea of yours and they look lovely…My mother has a very happy smile when we talk about you you… Your "over and beyond" the call of duty kindness and hard work is truly appreciated and felt.